Why are these the 11 best 2016 luxury crossovers? You can have your luxury and utility, too, not to mention true performance and real prestige. This is the happy convergence of upscale attributes that underpins our 11 best luxury crossovers. Every size class is represented – from the burgeoning subcompact category to the new-age limousine range — but only great values for the money make the cut. We present them from least costly to most expensive and list base prices that include manufacturer destination fees, which average about $950. The all-new X1 makes waves in the rapidly expanding premium-subcompact-crossover field by abandoning some BMW gospel for a more conventional – and competitive — doctrine. Gone is the rear-wheel-drive engineering and classic inline-six-cylinder engine that gave its predecessor sports-sedan character but cost it valuable interior space and fuel economy. Like formidable rivals such as the Audi Q3, Lexus NX, and Mercedes-Benz GLA, this second-generation X1 is based on a lighter and more space-efficient front-wheel-drive design. It’s an architecture shared with BMW’s offshoot Mini brand, but here fortified (and de-stigmatized?) with the German automaker’s xDrive all-wheel-drive system as standard. This second-generation X1 is about the same length overall as its 2013-2015 model but has a 3.6-inch-shorter wheelbase and a taller roofline. Styling is evolutionary and still demonstrably BMW. Passenger and cargo volume expand to among best in class and driver and front passenger enjoy a more crossover-like feel thanks to a higher seating position. 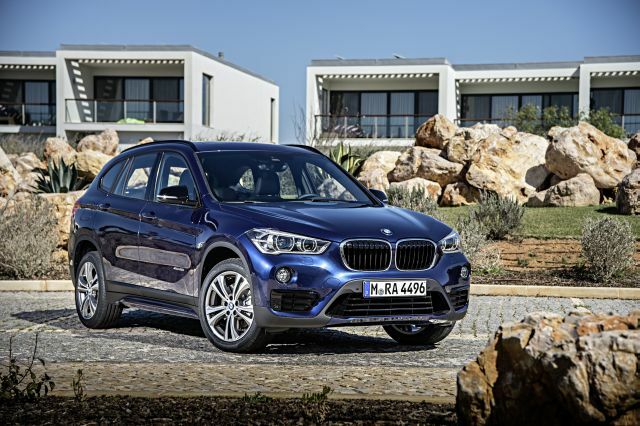 The ’16 launches as the X1 xDrive28i with a new 228-horsepower turbocharged 2.0-liter four-cylinder engine. It’s down 12 horsepower from the outgoing turbo-four, but less curb weight keeps performance on par and fuel economy should handily beat the old AWD model’s 26 mpg city/highway combined, though EPA ratings were not final as of this report. There’s no counterpart to the first-gen’s 300-horsepower six-cylinder xDrive35i model. And while the new X1’s handling is a little less athletic, it’s still BMW-lively and, just as critical, furnishes a more comfortable ride and a quieter cabin. That’s the dose of refinement it’ll need to succeed in this fast-growing segment.